Hope you are having a great summer day. Had my diet coke on the lanai this morning while watching the golfers (who gets up that early to golf? ), the birds are chirping and the cutest bunny ran across the 18th tee. 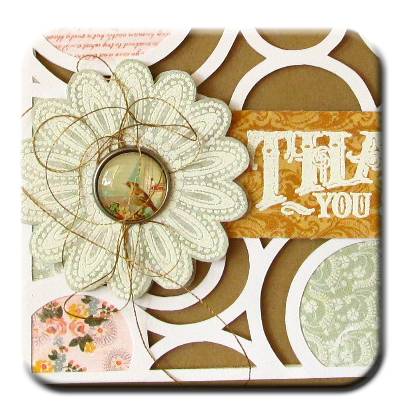 I love the muted colors Shari used on her card, so I stuck with that. Came up with a similar die cut background with my beloved Silhouette Cameo. Stamped and heat embossed the flower (new Penny Black - Dazzlers) and adhered with a shiny glass brad. What a fantastic take on Shari's card! Love the prety dp inserts you added - so much movement on this one! Very pretty, also love the sentiment and textures. Hmmmm, perfect Case!! I made one for this challenge, too but it's hard to recognize the inspiration!! Hugs. I am so darned impressed by this wonderful, beautiful, fabulous card! Way to rock those circles and all those soft florals!! Oh my goodness - looks so great!! I love this circular treasures! You are so talented! Thanks for playing along with us at CASE Study! I had to come back again I love this card so much. ;) Congrats on the tweet from Penny Black! Hello Penny, I saw your card at Case Study and am drawn to it! Did you use the designer edition software to design the background or the regular version? Thanks! Love that you repeated the background of Shari's card! Looks amazing! Thank you for being with CAS(E) Study this week. How pretty! Love how you were inspired!